Address: 3101 Hamilton Way (bottom), 1435 Elevado Street (top) - Some parking on Hamilton Way so try that first. Summary: These steps are really just a neighborhood function -- you aren't going to get much of a workout unless you combo platter these with other stairwalks close by like Descanso and Music Box. And believe me, you can get an excellent taste of the neighborhood because there is literally no privacy -- it's super open and exposed, and it kind of feels like you are walking through residents' patios. 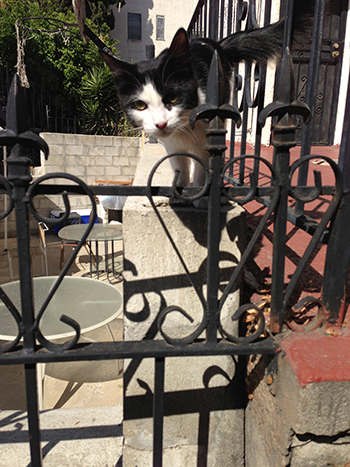 You're not, but then again, the angry guard cat that I encountered totally glared at me as if to say, "Yo, beyotch, get off my property or I'll scratch you!" kinda gave me the impression that I should turn back. I'm glad I didn't, because there is a cute neighborhood at the top (with an equally cute guy waxing a vintage Mustang). On that note, it was worth the trip!